It's like neon green on your plate and screams 'fanciful.' Yet, as with many of my kitchen ploys: basil simple syrup is quick & easy to make. Why bother? Basil syrup is brilliant on macerated strawberries or strawberry shortcake, and with any cobbler: maybe peach or plum? My sons use it for Italian sodas. 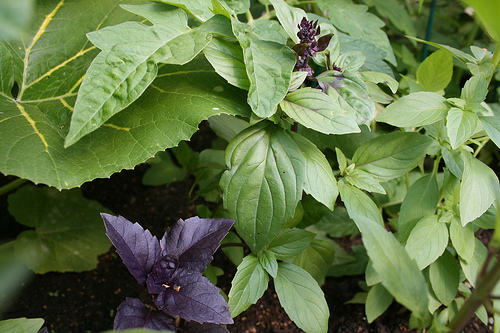 They drink Mint Italian sodas---so why not Basil? BTW: this syrup is not super thick, so it isn't ideal for perfectly zig-zagged lines on your dessert plate; however, it IS great for drizzling on top of berry or vanilla ice cream, sorbets and fruit crumbles. Especially in the case of cobblers and shortcakes: just make a pool of basil syrup (see top photo) on the plate and stick the dessert right on top. Blanch the basil and spinach in boiling water, uncovered, for 10 seconds. Remove from the pan and immediately shock in ice water to stop the cooking and hold the color. Squeeze any excess water from the leaves and coarsely chop. Puree with the Simple Syrup for 3 minutes, or until bright green. Strain through a fine-mesh sieve. Store in the refrigerator until ready to use. Am thinking: Basil mojito anyone?